The personal health and safety of each employee is a primary concern at Pioneer. The prevention of occupational injuries and illnesses is of such consequence that it will be given priority over operating productivity when necessary. Management will go to great lengths to provide all mechanical and physical facilities required for keeping up with the highest personal health and safety standards. 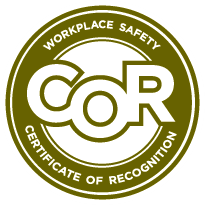 A Certificate of Recognition (COR) shows that the Pioneer’s health and safety management system has been evaluated by a certified auditor and meets provincial standards. These standards are established by Occupational Health and Safety (OHS). Compliance management is inherent in multiple disciplines across an organization. For Pioneer’s clients, contractor management is the starting point to minimizing business risk, but full compliance management is multi-faceted. All areas can have significant impacts on a business’ operations, brand, and financials if not handled effectively. Partnerships in Injury Reduction is a voluntary program in which employer and employee representatives work collaboratively with government to build effective health and safety management systems. By improving health and safety, the social and financial costs of workplace injury and illness are reduced. The Alberta Construction Safety Association (ACSA) is Alberta’s partner in construction safety. Through our training and certification programs, we work hard to connect a community of safety leaders in the province’s construction industry. Our members include all employers with a valid Workers’ Compensation Board (WCB) account that fall under specified industry codes within the construction sector. Avetta helps our customers to reduce costs and streamline contractor management through prequalification, document management, auditing, employee-level qualification and training, insurance verification, and business intelligence. ISN takes pride in leading efforts to improve the efficiency and effectiveness of contractor management systems and in serving as a forum for sharing industry best practices among our members. Developing relevant policies and procedures which support a safe and healthy workplace. Providing a safe & healthy work area, free of hazards such as those that may cause slips, trips or falls. Conducting regular and scheduled inspections to find and eliminate unsafe working conditions and practices, to control hazards, and to fully comply with the Health & Safety Standards of every job. Ensuring all tools and equipment are safe and maintained in a safe condition through proper Inspection and Tag Out Procedures. Ensuring all Employees are competent to perform their assigned tasks through Safety Training. Empowering our employees to implement safe and healthy practices in the workplace by supporting on-going training and certification as well as instilling in them the responsibility for their own safety as well as promoting that of their co-workers. Investigating every Near Miss and Incident promptly and thoroughly to find the Root Cause and to correct the deficiency to avoid re-occurrence. Providing open, honest and effective Safety Communication through everyday activities and Toolbox Meetings. Supporting Managers and Supervisors and their commitment to the continued maintenance and improvement of Health & Safety Standards for the Benefit of our employees and customers. Acknowledging and supporting the right of all employees to work in a Safe and Healthy Environment.